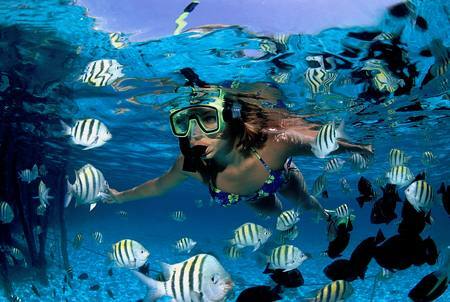 There are plenty of little surprises waiting to delight you amidst the coral reefs of Maldives. Always keep in mind that every creature is not friendly. Know these tips to avoid risk situations caused by harmful sea animals. Most of the tourists who opt to discover the underwater world are not divers hence, they tend to witness the exotic marine life by snorkelling. You should be well aware of the aggressive marine creatures and how to stay safe while snorkelling. The Lionfish, one of the most beautiful fish in Maldives will definitely tempt you to come close. Do not touch the animal since once you come close it would come to you and inject its venom in your body. You’ll come across some kinds of fish known as ‘territorialists’. Those species are so keen on protecting their nest or area. If you reach towards them, they’ll think it as a threat and will get spooky. Therefore, whenever you spot a difference in their behaviour it’s better to turn and swim in another direction. Your holiday in Maldives will not be completed without a dolphin watching trip. Those who are residing at many a resort in Maldives the likes of Kuramathi Maldives can experience an awe-inspiring Dolphin and whale watching trip. Avoid jumping into the water when you see a group of dolphins beautifully running with the boat. Keep watching from the boat! You should be cautious about Sting Rays because these sea creatures have the ability to camouflage themselves in the sand. If you feel that you’ve treaded on a ting Ray, do not lift the foot except try to slide them in the sand. Previous Post Adventures at Bundala National Park – Wild Encounters!